Click This | Nature Photography News Around the Web, April 2011. 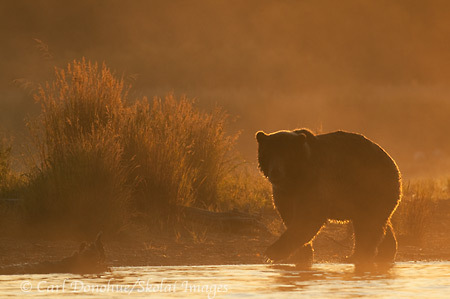 A coastal brown bear, Ursus arctos, walks along Brooks River shoreline at dawn, backlit, Katmai National Park and Preserve, Alaska. Next up in this series of news of the month pieces. This month, I haven’t been spending as much time in the woods, and even less reading the news. Mostly, I’ve been grating sandpaper over my eyeballs … more commonly called “working on website updates”. I need to take about a year off, and learn how to do this properly, then start over from scratch and rebuild everything (yeah, that’s gunna happen). Below I’ve compiled various bits from around the web that held my failing attention long enough to actually read through the piece. Feel free to add your own stuff of note, I’d love to see some things I’ve missed. Northern Lights Photos I saw this the other day. A nice compilation of photos and a video of the Aurora, both borealis (northern) and australis (southern). Included are shots of the aurora both from space and IN space. Hubble space telescope photos of the aurora on Saturn. That’s a first, for me at least. And definitely check out this video/time lapse Terje Sorgjerd at the bottom of the post. Very cool. A new blogger (for me, anyway). I wasn’t familiar with fellow Aussie photographer Mitchell Kanashkevich until I read this recent post on the aspirations of a Travel Photographer. Nice discussion, and his site is worth keeping connected to. Google reader time again. Extreme Sheep LED Art This is simply way, way, way too cool. I mean, awesomely cool. “We took to the hills of Wales armed to the teeth with sheep, LEDs and a camera, to create a huge amazing LED display. Of sorts”. Do yourself a favor and watch this video. Do yourself 2 favors, and watch it again. What’s wrong with global Photojournalism? Photographer discusses the state of photojournalism today, as presented in the recent “world’s top press photography contest”. A better discussion might be on the point of such contests. Quote #1: “What the events reveal is the thinness of the margin on which modernity lives.” Bill McKibben, on the tragedy in Japan. Capture NX2 tutorial I wrote a post a while back about Nikon Capture NX2, and how much I preferred the results to Photoshop’s ACR. Here’s a quick tutorial from Nikon (Nikon no longer make NX2) on making some simple adjustments with the program. Things are never as simple as tutorials suggest, but this is helpful. Composition I’m always in 2 minds about these kinds of articles. In some ways, they’re useful, but in so many other ways, they just seem to regurgitate old rules that don’t need to be regurgitated. Zappa’s “Shut Up ‘n Play Yer Guitar” comes to mind as a response. Still though, it’s nice to read something like this once in every great while. Fair Use and Photos A Photo Editor’s take on a recent decision in federal court. The case involved a claim of Fair Use, by Richard Prince, Gagosian Gallery, Lawrence Gagosian and Rizzoli International Publications, after photographer Patrick Cariou filed suit for copyright infringement. Prince “appropriated 28 images from Patrick’s Yes Rasta book for his Canal Zone exhibit at the Gagosian gallery”. Good news? Photographer wins. Branding Do you brand? Do you think it’s important? Do you know what it is and how to do it? Do you want to? “Your brand is a promise to the client”. A few tips here on the subject. WordPress Plugins WordPress is a great, great blogging platform. Virtually every “blogger” I know uses it. A few plugins here might be helpful to improve your photo blogsite. Which reminds me I need to install the Supercache W3TC plugin soon. Artists and Facebook USA Today has a news article titled “Artists draw on Facebook to connect, or sell their work”. I wonder if next week they’ll have a scoop showing that chocolate tastes great. Seriously though, interesting article, looking at how something like the net is a boon for some artists, and a hassle for others. AWARD WINNERS 2010 National Medal of Arts and National Humanities Medals were awarded by President Barack Obama. A list of winners is here. I’m jazzed that Sonny Rollins (pun intended) was awarded a medal, and also James Taylor, Quincy Jones, and Wendell Berry. Congrats to all the winners, what a great achievement and recognition. Quote #2: “The creative person is both more primitive and more cultivated, more destructive, a lot madder and a lot saner, than the average person.” – Frank Barron. Waste Land A documentary film following photographer Vic Muniz in Brazil. Muniz set out to change the lives of an impoverished group of self-assigned pickers of recyclable materials. “Creating portraits of the garbage pickers, selling them as high art, and giving all the money back to the community”. Mount Blackburn at dawn. 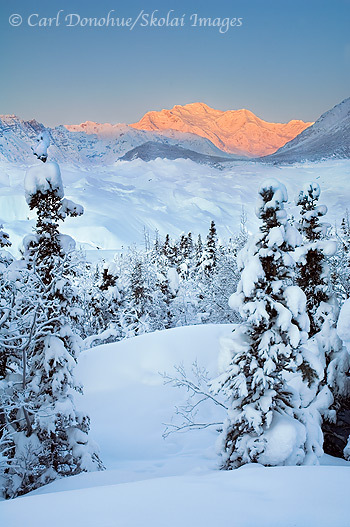 Winter photo, from Wrangell – St. Elias National Park and Preserve, Alaska. Tuamotu Kingfisher – less than 125 of these birds remain today, living on a tiny island in the South Pacific. “as a result of development and human-introduced”. A researcher is working with farmers and other island inhabitants to stem the extinction. At stake? “50,000 years of uniqueness and evolution”. An interesting approach. Article here. The End of Overfishing? Article by By Michael Conathan, CAP’s Director of Ocean Programs. Suggests that climate change overrules managing proximate factors. We can tweak everything else, for sure, but at the end of the day, the climate will decide. Climate Progress is a great site. What is Marine Wilderness? Article by ‘The WILD Foundation’, and a quick survey to take if you want, examining our precepts and notions on wilderness – and a question about marine wilderness. “Wilderness is what we believe it to be”. True? False? Wolves and the ESA Recent action on the issue of Endangered Species Act listing of wolves in the Greater Yellowstone Ecosystem. “conservation groups and the U.S. Department of the Interior (DoI) reached a compromise to remove protections for the animals in two states”. Details here. Trapped Alaska magazine editor Tim Woody writes a blog about finding a wolf in a trap on a recent trek near the Portage flats. It’s a dilemma; legally, one is not allowed to do anything in such a case. I’ve often wondered how I might response if I ever have the misfortune to come on such a scene. Bison versus mammoths What caused the extinctions of so many species of enormous creatures in North America 10 000 years ago? “experts debate: climate change, overhunting by humans, disease—or something else? Eric Scott, suggests it was something else: namely, the immigration of bison from Eurasia.” Scientific American article here. Lessons from a Calamity Bill McKibben may be the best of the current crop of environmental writers. Andy Revkin highlights recent articles by Bill McKibben and George Monbiot — both leading voices of environmentalism, on lessons we might learn from the tragedy in Japan. McKibben is fantastic. Quote #3: “If you fall into the creeks up there while fishing you die dont you?” – internet question about Alaska. This entry was posted in Alaska, Art, Environmental Issues, Grizzly Bears, News, Photo business, Photography, Social Media, Stuff to Click On, Tech Stuff, Wildlife, Wrangell - St. Elias National Park and tagged conservation, Environmental Issues, Grizzly Bears, Mount Blackburn, News, Wrangell - St. Elias National Park on March 27, 2011 by Carl D.